Since my sister is 9 months pregnant, my parents offered to bring my niece up for Molly's party. Emmie and Molly loved having a sleepover three nights in a row! 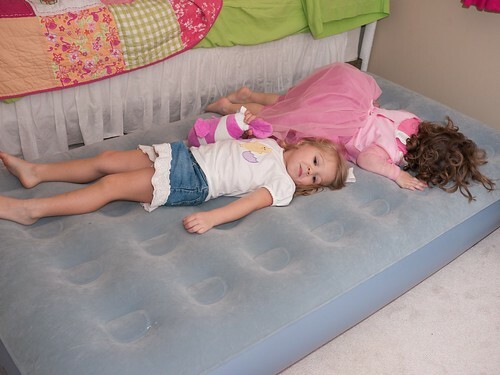 The girls had to test the air mattress out shortly after it was inflated. 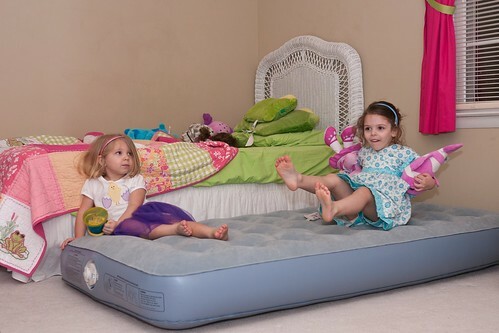 Of course, a new bed requires a little bounce. 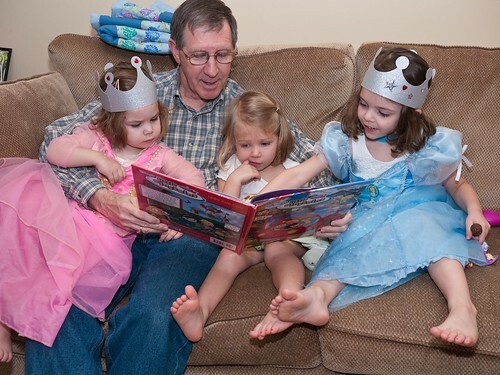 After a fun party, it's nice to relax and read with Grampa. Molly was of course excited to open up all her new toys and play with them, but she wasn't the only one. 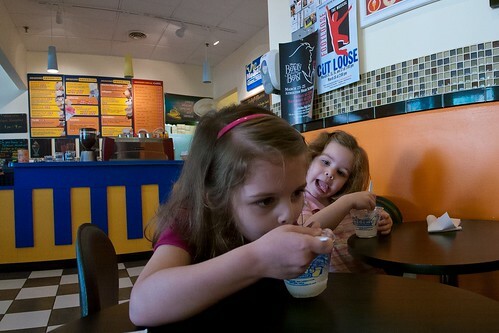 Emmie and G'Mom had to try them out as well. With no desire to fix a meal after a busy day, we decided to get Chinese take-out. 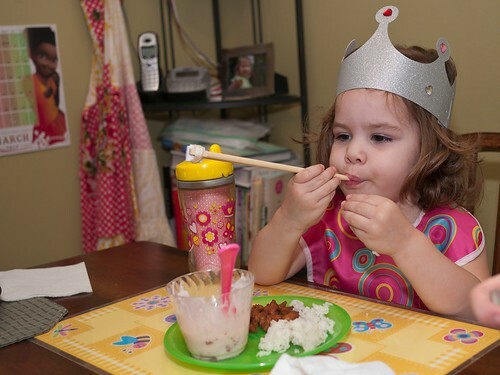 When Chad started using chopsticks, the girls all wanted to join in. 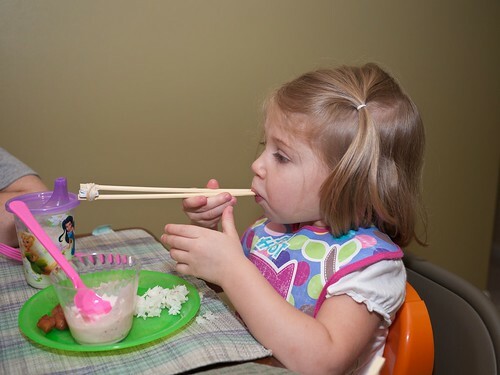 Molly's been using chopsticks (with the help of a chopsticks holder) for some time, but this was the first time for Emmie and Leah. After church on Sunday, Molly opened more presents. This time, they were all from G'Mom and Grampa, including this dress G'Mom made. 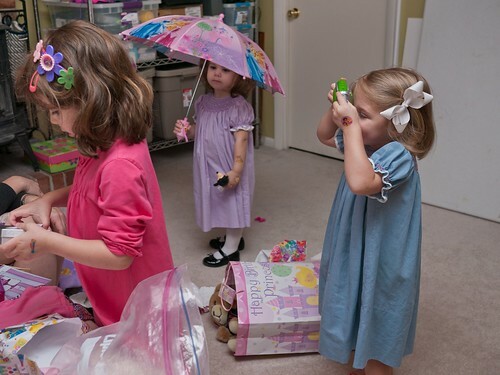 While Molly opened her presents, she was watched by an onlooker (Leah) who is apparently worried about rain and a member of the paparrazi (Emmie) who took lots of pictures. All smiles for a fun weekend! Today, Molly turns 5! 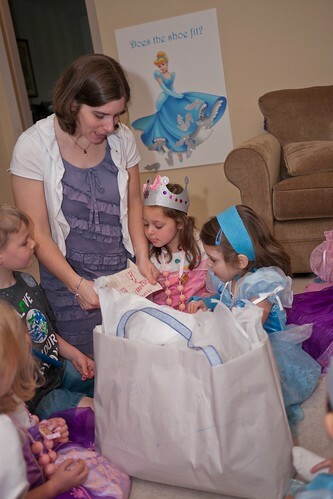 We celebrated on Saturday with a Princess & Prince Party. 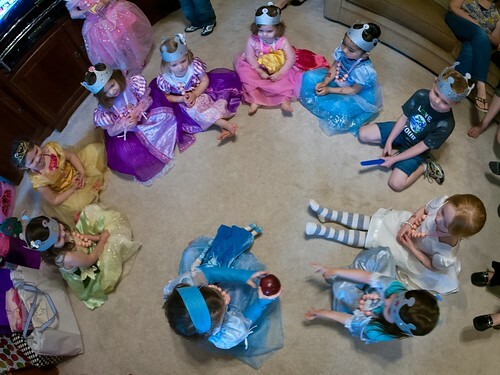 As the kids arrived (dressed in royal attire, of course), they each decorated their own princess or prince crown. 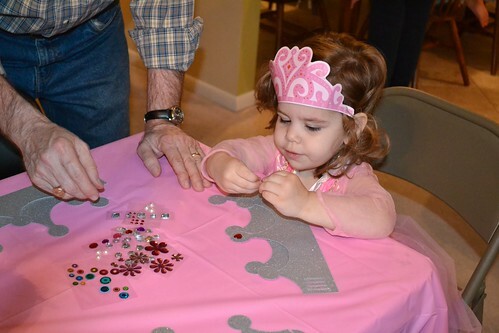 Leah apparently thinks the more the merrier when it comes to crowns! We then played three group games, each themed with a particular princess and preceded by a reading of that princess story. 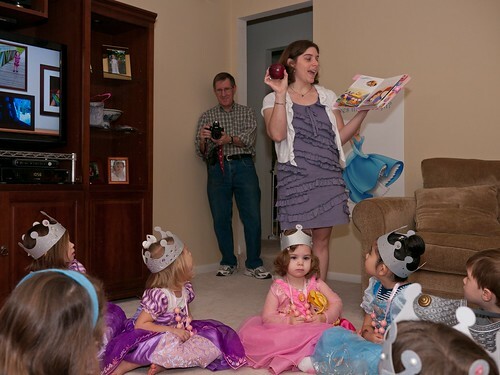 Here I am reading the story of Snow White before playing Pass the Poison Apple. 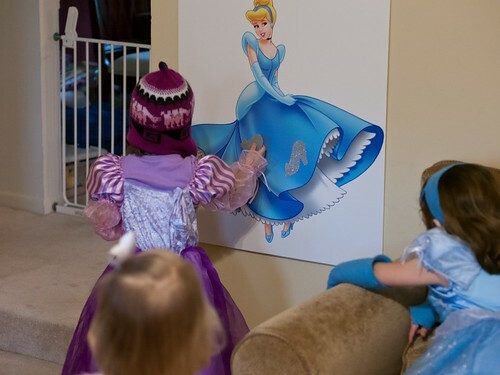 The second game was like Pin the Shoe on Cinderella. Instead of a blindfold, I used these lovely Peruvian hats given to us by Aunt Caroline. It's so nice that these kids are old enough to sit and listen now. Here are all the big kids listening intently to the third story about Ariel. The last game was Under the Sea Limbo. You may not be able to see it in this picture, but the limbo bar is covered in Ariel, her friend Flounder, and some crafty kelp. Of course, opening presents was lots of fun. Molly's now old enough to read a card to see who a present is from (though she has very little interest in doing so). Also, she moves through the presents quickly without getting easily distracted. 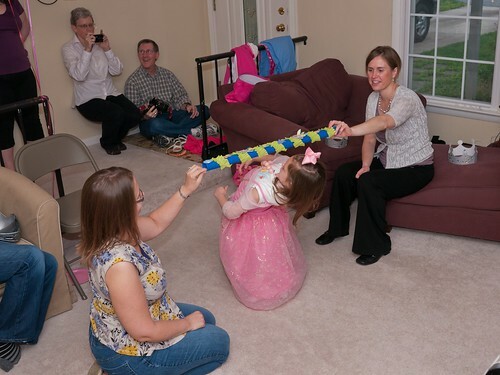 Molly loved being sung to, especially the extra "cha cha cha's" added in by many of her friends. You can watch the video of her birthday song here. 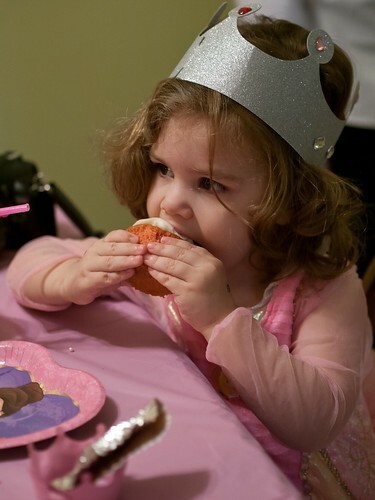 Leah shows the only way for a kid to eat a cupcake - icing first. I definitely had fun playing with my new Silhouette digital cutter for this party. 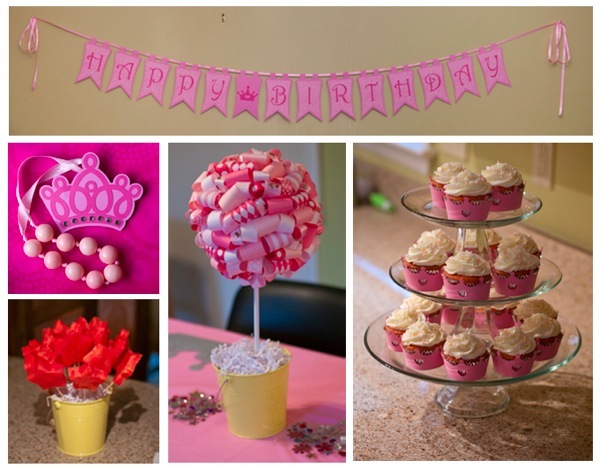 Here are a few of the other party details. 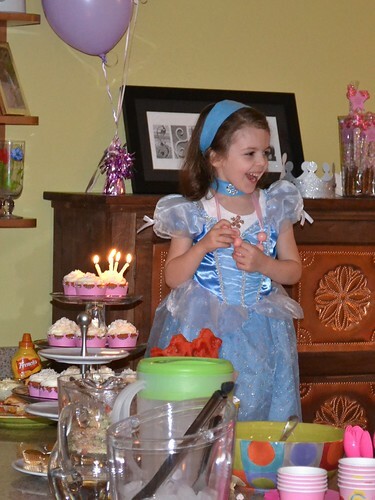 Two of Molly's friends left the party saying this was the best party ever, and asking for a party just like Molly's. 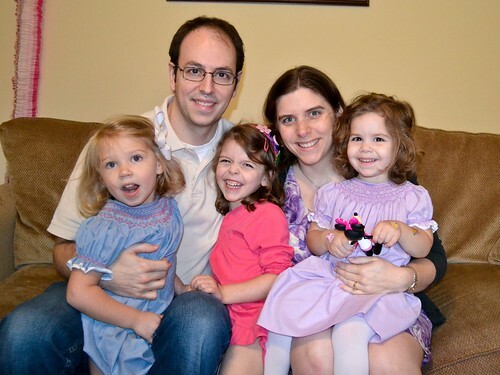 Clearly, the kids had a great time! 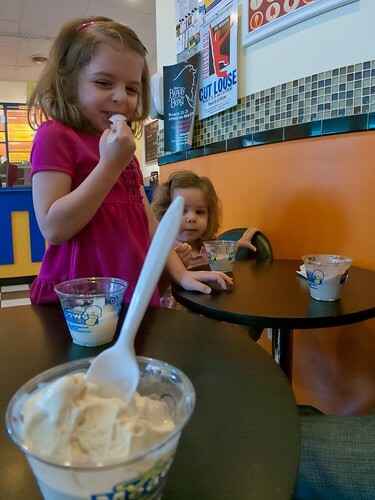 On the first day of Spring, Rita's gives away free Italian Ice. So, we all headed to Rita's to partake. When we got there, the line was hundreds of people long. So, we bailed and headed to Meadows instead. 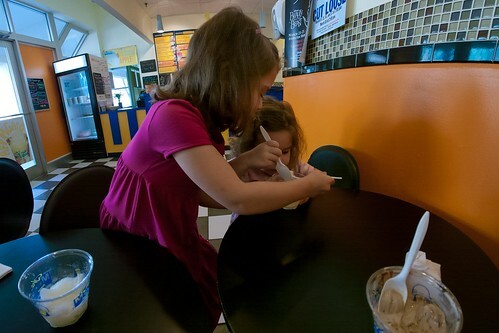 Molly got Italian Ice, while the other 3 of us got frozen custard. 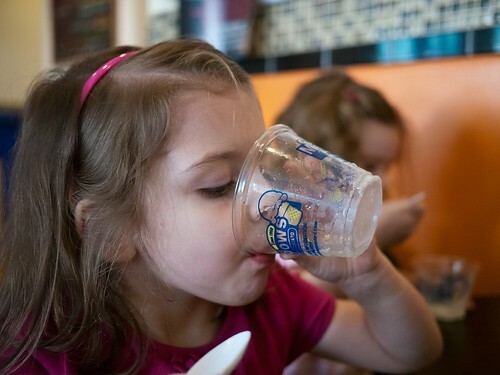 Molly liked her lemon ice, but she didn't want to miss out on the custard. Don't miss a drop…from the spoon or the chin. 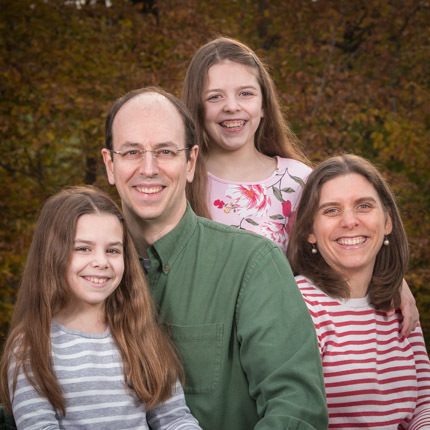 Amidst the fun of the birthday celebration weekend, Molly also sang a couple songs in church with her choir with a little accompaniment from me on the first song. 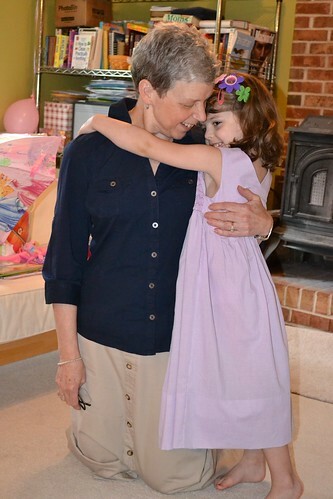 We celebrated Molly's birthday Saturday (though her actual birthday is not until later this week. 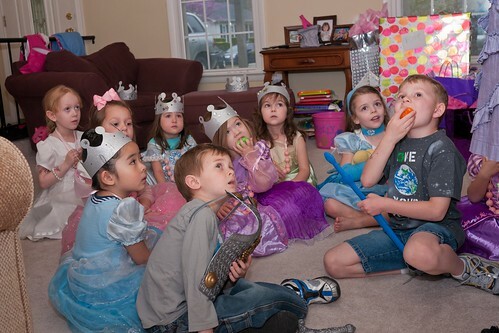 It was a princess party, and everyone came dressed as a princess (except for the two boys who were the knights). Happy Birthday Molly! Just a little tickling on the couch. In case you can't understand it, the second magic words are "bippity boppity boo" (though the first set are funnier). Molly's preschool held a Family Fun Night for everyone, which included this African drummer. At one point, he pulled out this drum to drum a child's name. Since Molly had been so engaged, he asked her what her name was. I didn't get video of him asking her name, but this starts right after he asked, as he attempts to say her name with the drum to the standard of Molly's satisfaction. Leah's new favorite thing to do at the end of her bath is to pour water over her face. Craft Hope collects handmade goods from around the world for people who need a little HOPE. Their latest project has been to collect beanies and bags for kids fighting cancer. 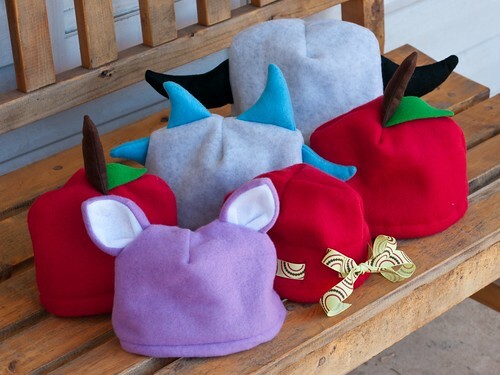 So, two friends and I pulled our efforts and contributed six fun fleece hats for the cause. Thanks Josie and Lisa! Just a little taste of a normal evening before bed in our house. Lots of dancing, lots of silliness.